This is Tina with part of the catch taken with a Kontiki and a Dropper Rig. 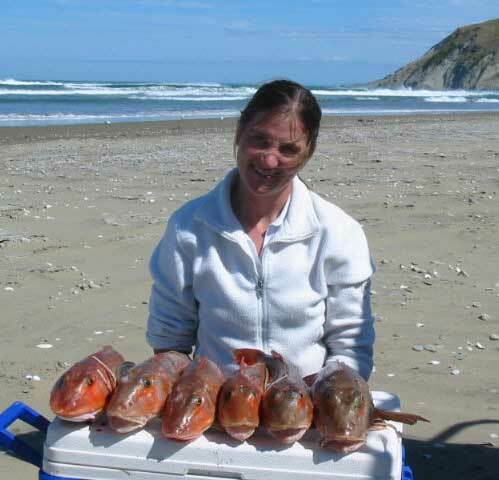 The gurnard were caught on Monday from Porangahau Beach. The best fish of the day weighed 1.56kg and has been entered into the gurnard section of our competition. It is the second best fish weighed in so far. Tina is on holiday in NZ and is staying in Norsewood with the McGregor's. She really enjoyed her time out kite fishing and wants to come back again for another days fishing. The fishing has been patchy over the past week on the beach. I am expecting the fishing to improve by the weekend as it's full moon tonight. I have had many good reports about the crayfish. They seem to be in close and in good condition, so I expect it will stay that way for the holiday season. If you are in our area call in, record you catch and have your photo taken. I was talking to Bodo Luckfield at the shop yesterday. He was kite fishing at Muriwai Beach on Wednesday with his Big Dropper Rig. He caught two snapper and one hammerhead shark from two sets of 15 hooks. The hammerhead was over a metre long. Bodo reports the wind was very fickle. On the first set he used his Nighthawk Kite and Skyhook. It was out about 600 metres, going straight out and where he was standing, the wind was blowing down the beach. Unfortunately the kite went into an area where there was no wind and the kite went into the water. He managed to retrieve it and was glad he had used a Kite Safety Float with his kite. The dowels on the kite broke, as they are designed to do, and retrieval was not a problem. The second set he decided to try out the Super Kite and a Skyhook. Bodo was determined to get another set in before leaving for home. The kite was going out well until it found an area with no wind and this dropped into the water as well. The dowels broke and the Kite Safety Float made the retrieval process easy. Bodo was happy with his catch for the day and was just so pleased to be fishing at Muriwai Beach after spending so much time fishing on the east coast. Muriwai is Bodo's favourite beach to kitefish from, this is probably due to the 7.5kg snapper he caught earlier in the season. Before leaving the beach he was approached by another kite fisher. This man had been using kite gear from another supplier and had so much trouble getting his gear set. Eventually he lost all of his fishing gear into the water and didn't manage to retrieve it. So he left the beach minus his kite gear and no fish. On Monday Bodo was fishing at Te Arai Point in Northland. He put out one set of 15 hooks on his Big Dropper Rig. He caught one gurnard. This was good as Bodo's wife likes fresh gurnard. Bodo was enjoying being out kite fishing after a break away from fishing. His excitement was evident even when I was talking to him in the shop yesterday. At 78 years old he is happy to be hauling in the Big Dropper Rig on his own. He puts a towel under the shirt on his right shoulder and just walks the line in at a steady pace. If he hadn't needed more spare dowel Bodo would have been out kitefishing again yesterday. I arrived at the northern end of Orewa beach around 7.00pm on Sunday 8th December. The weather was perfect for kite fishing with my Flexiwing Dropper Rig. The wind was strong and blowing directly off the beach. The kite went straight out and high - the local audience were impressed! To my left there was another kite fisher who was obviously having major problems with his kite. It was tacking straight for my line, which by this stage was about 600 metres out off the beach. A quick walk up the beach confirmed my first thoughts - the gear he was using was not from Paul's Fishing Kites, but from the competition! No wonder he was having problems, and it was only his second time using the gear. My kite was certainly a good advertisement because his was so unstable and out of control! Unfortunately the fishing was not so good. The tide was coming in fast and I was using squid for bait, but the snapper (or any other fish) were not interested! I only managed one set because with this guy's kite heading for my gear I was not going to risk putting my kite further out and getting snagged with the competitors gear! I will certainly go back to Orewa again and go out further next time - there were no snags encountered and it is a wonderful beach to fish from. We went kite fishing last Sunday at Pikowai in the Bay of Plenty. It looked like a great place to fish so we set up our rig opposite the camping ground. The breeze was west to southwest and blowing around 12 knots. First set was a test as this was the first time the Flexiwing Kite had been sent out. We put the gear out to around 600 metres offshore baited with squid. I left it to fish for about 20 minutes. One fish came in on the first set of five hooks, a monkfish or stargazer as some people call them. Very ugly fish but great eating. This was a good start. Put the kite straight back out for about 45 minutes this time and caught one snapper. It was getting late and the kids needed feeding so we packed up and headed for home. More luck next time. Ed: Try using a mixture of fish bait and squid next time out as the gurnard still seem to be about in the Bay of Plenty. Good to hear you had a successful time on your first attempt with the Flexiwing Kite. I went to Pakiri Beach in Northland last Saturday with my Big Dropper Rig. We set the rig out twice in the moderate northwesterly wind. The tide was going out at the time and I used squid for bait. I caught one gurnard but no snapper. Look forward to another day out on the beach with better results. A good day to be on the beach anyway. The northern end of Ruakaka Beach in Northland is fishing a lot better than the southern end. I was talking to a mate who went to get tuatuas from the beach and while he was there he had a chat to a kite fisherman on the beach. He put out two sets and caught four to six snapper per set at the northern end. Further south he was getting two or three snapper per set. This bloke was setting out to 1500 meters using a Bottom Longline Rig. The bait he was using was squid on half the hooks and tuatuas on the other half. Be aware there is intermittent foul out there at around 1500 metres. l will be out there myself as soon as I get my ute back on the road. Cheers, have a good one Robbie, part time farmer full time fisho! Paul's Fishing Kites are taking a break from the newsletters over the Christmas period. We will not be sending out another newsletter until Thursday 16th January. Keep sending in your fishing reports and pics during this time as we will send out a newsflash if something really interesting comes in. Have a happy and successful fishing season from the team at Paul's Fishing Kites. The prize is available for photos of catches taken on one of our kitefishing rigs or with our Target Hooks. There is no limit on entries so you can send in as many pics as you like. The photo is a shot of some nice Northland snapper taken from Uretiti Beach. A favourite kite fishing spot of David's during a southwesterly blow. A $30.00 voucher will be out to you very soon. An early Christmas present for you from Paul's Fishing Kites. Enjoy.